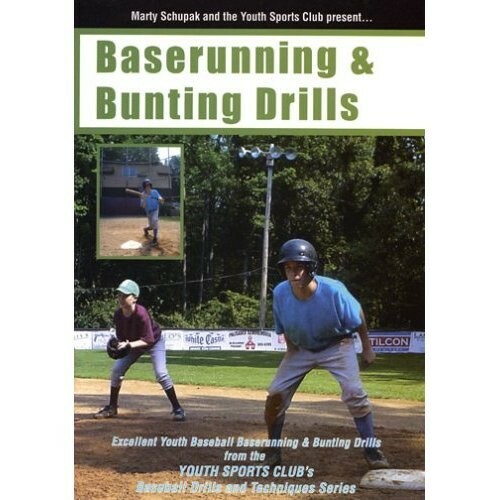 In the "Baserunning & Bunting Drills" DVD, nationally known youth baseball coach Marty Schupak addresses two of the most underrated and under-coached skills in youth baseball: baserunning and bunting. This video provides some of the most fundamental and creative baserunning & bunting techniques for the youth player. It will show you how to get 1-2 extra runs per game while teaching players skills they will take beyond the youth level. Baserunning is one crucial skill that is rarely practiced in baseball, especially on the youth level. Practicing proper baserunning fundamentals will increase scoring opportunities in games while forcing young ballplayers, 7-12 years old, to pay attention while on the bases and be ready for all situations. The baserunning portion of the video points to some of the most basic skills, such as sliding and running techniques, while also addressing more advanced techniques, such as the delayed steal, tagging up, and reading signs. Bunting is also a skill that needs to be practiced at a young age. The creative bunting drills in this video allow even average skilled athletes to achieve success while learning a valuable "small ball" strategy in the sport. The bunting section goes through the different types of bunting techniques, such as the square bunt and the pivot bunt, while always trying to keep the explanations simple for the age group in mind. The video then shows a few strategies that combine both baserunning and bunting. This program stresses why baseball is called "a game of inches", and it is one of Marty Schupak's best produced programs. Appropriate for youth players 7-12 years old. Run Time: 34 minutes. for all Little League coaches & parents."